Never think you know all good smooth jazz musicians. 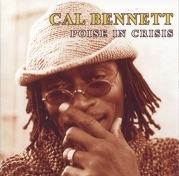 Cal Bennett's new album "Poise In Crisis" critically reminds me to continue my quest. Cal has toured with Niki Haris, Carl Anderson and recorded with Ice Cube and served as musical director for Toni Braxton on The Tonight Show with Jay Leno. He also played and recorded with Stevie Wonder, Dionne Warwick and Donna Summer. One can draw conclusions and regard Cal as a professional musician. Besides this his new album "Poise In Crisis" is nothing than a masterpiece. The album starts with Yoruba Healing. "The rhythms and forms of Yoruba religion are said to be fundamental to the development of many forms of African American music from gospel to blues and jazz, and to musical forms such as Salsa and Latin Jazz", comments Cal. Yoruba Healing's rhythm is the pulse of Africa and Cal's sax the voice. This is ultra funky stuff with a snappy power of groove. Oliver Brown (percussion) and Raymond Calhoun (drums) are creating with Cal (programming) a fantastic irresistible rhythm tapestry. Cal 's staccato sax sets brilliant accents. The One I Love is a slowtempo urban tune. The keyboard tones fall like raindrops. Based on a hip hop rhythm Cal generates a smooth intriguing melody with great emphasis. I like this funky complex rhythm I already heard by groups such as Loose Ends, Soul II Soul or Pressure Drop. So You Say (And It Is) has this certain kickin' groove and Cal's sax is the high end of melody. Look In Your Heart is featuring singer Rob McDonald. Rob has performed with artists such as Lincoln Adler ("The Dream") and Rain-Bo Tribe ("What They Don't Tell You"). This slow tune let you concentrate on Cal's sax inspired melody. The Creator Has A Master Plan was, in its original form, an extended 32-minute distillation of its authors' musical and cultural ideas. It first appeared on Pharaoh Sanders' 1969 album "Karma", with co-author Thomas on vocals, keyboard player Lonnie Liston Smith, flautist James Spaulding, french-horn player Julius Watkins, Reggie Workman on bass, second bassist Richard Davis, drummer Billy Hart and percussionist Nathaniel Bettis. Cal transforms this song into a hip hop driven tune featuring Rob McDonald's raw vocals. A magic voyage into sound. Eclectic is based on the principle of hip hop rhythm and jazz improvisations. Cal's piano solo is remarkable. If you like the fretless bass, Indian Summer- ycbmp can be your favorite. Freaky Davis is the bassist. Like most of the other tunes Cal's arrangement is perfect. And the best news we can await new albums soon. If you are doubting that Cal is a jazz musician, Bubble will convince you. His improvisation potential is breathtaking and mesmerizing. This time we can listen to Freaky Davis on upright bass. Ok, that's the contribution for jazz critics. Cal is not only a sax player but also an impressive flutist and keyboardist. In the style of Herbie Mann he is fluently unwinding As Is. There For You is engraved by a cosmic keyboard sound. My impression: Cal is recording most of the songs in instrumental layers. Final instrument is his leading sax. I would like some more interaction between the artists. Poise In Crisis might be a good example for this live feeling although I suppose most of the part is make in the overdubbing procedure. David Scott's wah-wah-guitar turns the piece in a new direction. Very propulsive: Raymond Calhoun's drums. The final Give It has a continuous rhythm loop with a creaking sound. Although I would regard it as a deficit Cal knows to satisfy our taste with a lot of ideas overdubbed on this simple rhythm. A comparison of his new album to his previous albums is allowed. My conclusion: Cal is creative and incalculable like a chameleon. That makes me curious about his next albums. Certainly he will surprise me. The best a musician can do.